A slightly more moderate leader of Nigeria’s most brutal terrorist group is killed by his fanatical followers. Few nigerians will have mourned the death of Mamman Nur, a senior figure in Boko Haram, one of the world’s most brutal terrorist groups. A capable field commander, Nur is thought to have trained with al-Qaeda cells in the Sahara and with al-Shabab in Somalia. He favoured a pan-African jihad to replace sinful secular regimes with the rule of God. Three months ago he was killed by his own followers. Nigeria’s security chiefs were delighted. However, they should hesitate before celebrating. His death is a hint that the jihadist group—already known for kidnapping schoolgirls and turning children into human bombs—is becoming bloodier still. For all his grand vision, Nur was slightly more moderate than the longtime leader of Boko Haram, Abubakar Shekau (pictured), who rejoices in enslaving girls and “killing anyone God commands me to kill”. Under Mr Shekau’s command the group has bombed markets and mosques alike. Nur, by contrast, suggested that Boko Haram should only attack military targets and that using children as human bombs might not be an act of unblemished piety. His motives may have been tactical. By not engaging in acts of needless cruelty, the jihadists would be more likely to win support, or at least acquiescence, in the remote areas of north-eastern Nigeria where they operate. But Nur also had a theological disagreement with Mr Shekau over who was a Muslim and who could be declared an infidel and therefore killed. Mr Shekau thinks that everyone not loyal to him or fighting for his group is an infidel. Nur and Abu Musab al-Barnawi, the son of Boko Haram’s late founder, thought this too broad a definition. In mid-2016 they split away and swore allegiance to the jihadists of Islamic State in Syria and Iraq (who also thought Mr Shekau too extreme). They formed a new group: Islamic State West Africa Province (iswap). Since then the two factions of Boko Haram have fought largely separate insurgencies. 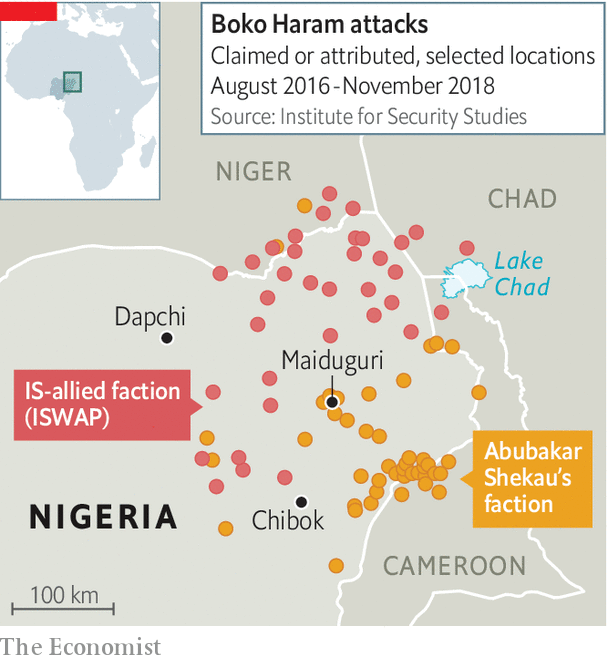 iswap, which became the dominant faction, has operated largely to the north of Maiduguri, the main city in the region: Boko Haram has kept to the south and east (see map). Now iswap’s policy of sparing civilians has changed. The circumstances of Nur’s death are unclear. Some people say he was killed in a falling-out over ransom payments for the release of 110 schoolgirls kidnapped early this year in Dapchi. A likelier explanation is that he was killed by younger, more extreme members of iswap who disagreed with his slightly more moderate stance. There is certainly evidence of growing brutality. A video released by iswap showed the murder of a kidnapped aid worker, Hauwa Mohammed Liman. She was bound, forced to kneel and shot. A colleague, Saifura Hussaini Ahmed Khorsa, was murdered in September, three weeks after Nur’s death. iswap said the two Muslim women, a midwife and a nurse, deserved to die because they worked for the Red Cross, which it argued proved that they were apostates. Observers worry that the likelihood of freeing other hostages, including 112 girls still missing after a mass kidnapping from a school in the town of Chibok in 2014, has diminished. “I doubt many more are coming back,” says another hostage negotiator. Meanwhile the government’s struggle against both jihadist factions has suffered serious setbacks. Army outposts and operating bases have been overrun in recent months. Attacks have spread into neighbouring Nigerian states. Some fret that Nigeria’s army may not be able to hold the ground it liberated in 2015, when Boko Haram controlled an area about the size of Belgium before being pushed out of most towns. Casualties among frontline troops have been high and morale is poor. More than 70 soldiers are facing court martial after a mutiny in Maiduguri in August, when they protested against being redeployed to an area that is a Boko Haram stronghold, near the border with Niger. Such military setbacks cast a shadow over presidential elections scheduled for February. Muhammadu Buhari, Nigeria’s president and a former general, won power in 2015 partly by promising to be tougher on Boko Haram than his predecessor, Goodluck Jonathan, had been. Having claimed last year that the army had crushed Boko Haram in its “last enclave”, he may fail to convince voters that he can do better if given a second term. Next year will see the conflict enter its second decade. More than 20,000 people have been killed; 2.1m have been displaced. If Mr Buhari cannot defeat the jihadists, Nigerians are wondering who can.